Graeme Ballard (coach: Steve Thomas) smashed the men’s T36 100m World Record in today’s BT Paralympic World Cup (Tuesday 22 May) in 11.98 (+1.9m/s), becoming the first cerebral palsy athlete in history to duck under 12 seconds in that category. 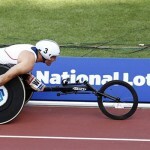 32-year-old Ballard – who won 200m bronze on his Paralympic Games debut in Athens in 2004 – appears to have at last recaptured the world class form he showed to medal in that event eight years ago. Now, at arguably the most crucial point in his career, he’s become a serious gold medal contender in London. “I feel absolutely amazing. What can I say…I just need to keep it going all the way now to the Paralympic Games,” said Ballard, who erased the five-year-old global best of 12.15 set by China’s Wa Wai So in 2007. 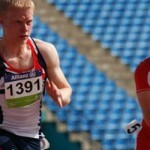 Ballard made it a golden double with victory in the T36 200m, clocking a new PB of 25.12 (-0.7m/s). Other British winners on the day were Jonnie Peacock (Dan Pfaff) in the T42/43/44 100m (11.32/-2.0m/s); Katrina Hart (Rob Ellchuk) in the T37 100m (14.43/-0.2m/s) and 200m (30.14/-2.1m/s); Richard Chiassario (Ken Day) in the T53/54 100m (15.04/-0.7m/s); Dan West (Jim Edwards) in the F32/33/34 shot putt (11.26m/1003 points); and Hannah Cockroft (Peter Eriksson) in the T34 100m (19.46/-2.4m/s). Peacock’s time was a lifetime best performance into a strong headwind and he credited in particular the changes he’s embraced in his last seven months as a full time athlete: “I’m delighted and I couldn’t have wished for anything better,” said the Lee Valley based athlete. UKA Head Coach Peter Eriksson was delighted with the team’s performance overall: “It’s been an amazing day with a lot of surprises and a World Record in the first event of the day which was the best possible start,” he said.